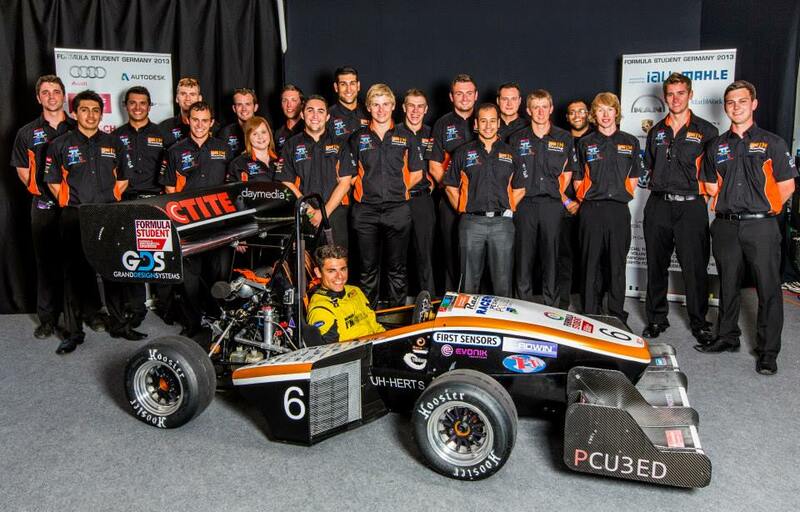 You may be aware of Formula Student, a wonderful innovation that allows the next generation of engineering talent to showcase and to develop their talent. It is a European competition for teams of engineering students from across the world to design, engineer and manufacture racing models, and is valued both within academia and within the motorsports industry (and its patron is Ross Brawn, no less). More details about it can be read here. And I was delighted to hear that the engineering students at the University of Hertfordshire have defended their title as the best UK Formula Student team for the fourth year running at the Formula Student Germany competition in Hockenheim between 31 July and 4 August. 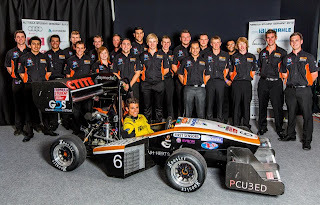 UH Racing's Formula Student team, part of the School of Engineering and Technology, came away from the 2013 International Formula Student Germany competition in 10th place overall out of over 100 world-wide competitors. The next UK team came 20th. UH Racing is currently ranked 23rd in the world out of more than 500 teams. The competition started with the static events, wherein the team finished 14th in cost, 17th in design and 35th in business. In the dynamic events, the team finished 13th in skid pad, 3rd in acceleration and 11th in the sprint event. Finally, the team finished 10th place in the endurance event which equated to 40% of the overall points, but this was with some drama as the car had to leave the track after hitting a cone and it overheated as it crossed the finish line. UH Racing this year entered a single combustion car in both the 2013 Formula Student and Formula Student Germany competitions. For further information visit the University of Hertfordshire's UH Racing website: www.racing.herts.ac.uk. Writing essay has to include life goal describing. You are proving that you really need this scholarship you have to show your target and skills. Click writing dissertations and theses to find more! They are the ones who acknowledge influential positions for assemble ventures help with writing essays completely investigate subjects for the papers they compose and influence well idea to out and fascinating class introductions. The DBE and the Four-year Untrained Teacher's Diploma in Basic Education (UTDBE) programs http://www.fashiongames.biz/can-gather-information-paper-help/ keep running by the CoEs are just comparable, yet not the same. Another imperative of it is that the understudy MURANG'A UNIVERSITY applying for the credit must have a working guardian or a gatekeeper to be the underwriter. Nonetheless, before the finish of the nineteenth century the span UNIVERSITY MURANGA of these establishments had expanded so significantly that the objective of recovery for individuals with handicaps simply wasn't working. Thanks for taking the time to discuss this, I feel strongly about it and love learning more on this topic. kalabharathi academy If possible, as you gain expertise, would you mind updating your blog with extra information? It is extremely helpful for me. Nice article. States a very good layout of learning python programming. best public school in delhiI am also planning to teach students to empower them.